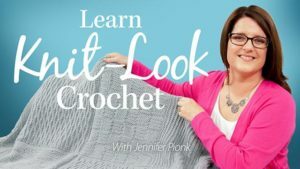 When you join us for a crochet along you will often be required to create a project page on Ravelry to be entered to win CAL prizes. 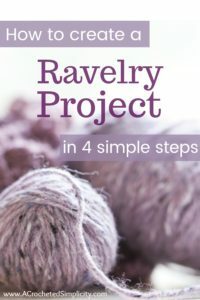 Creating a project page on Ravelry may seem overwhelming at first, but I promise it’s really easy to do and quite painless. If you’re not quite sure what a Ravelry project page is, think of it as your own personal journal. Once you create a page you can add your own notes, photos and more about the project you’re working on. 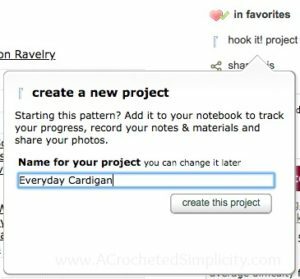 This is extremely helpful if you changed an element of a pattern to customize it for yourself as you can type in your notes so they’ll be there next time you want to crochet the same pattern again! Step 2: After you create a Ravelry project a new window will pop up that looks like the photo below. At this point the only thing you need to fill in is a name for your project, or you can choose to keep it as the pattern name or give it a new name that is easier for you to remember. After you’ve decided on a name, simply click on the button “Create this Project”. Step 3: After completing steps 1 & 2, you’ll be brought to your new project page where you can add photos and any notes you may have relating to the pattern. Step 4: Do not forget to hit save after all of your hard work! Visiting your project page later: If you need to refer back to your project page at a later time, you can do so by clicking on the “My Notebook” tab in the upper right corner. When a drop down menu appears, click on “projects”, the next page that opens up will be a page with thumbnails of all of your projects on it. Simply click on the thumbnail of the project you’d like to re-visit. If you have any questions, please reach out to me and I’ll answer them to the best of my ability.